We have all heard about the horrors of what global warming will do if left unmanaged. Rising temperatures will cause weather to become more extreme, sea levels to rise and species to go extinct. The way to stop all this is by reducing our greenhouse gas emissions. More and more countries are coming up with plans to do this, but the bottom line is it’s not enough. We are in trouble. Enter geoengineering. Geoengineering is a deliberate large-scale manipulation of an environmental process in order to counteract climate change. It kind of sounds like something you’d see in a science-fiction movie. Ever watch The Matrix? Just in case you’re of the few that haven’t, the humankind of the real world altered the atmosphere to block out the sun so artificial intelligence wouldn’t be able to use solar power to survive. 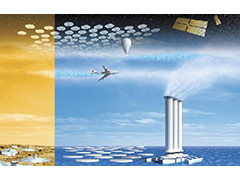 While that example isn’t exactly geoengineering, the concept is similar. Instead of altering Earth’s natural systems to thwart A.I., we are trying to neutralize global warming. One type of actual geoengineering is the injection of sulfate particles into the stratosphere, and another is putting mirrors into Earth’s orbit. Both of these have one aim in mind—shading our planet thereby reducing rising temperatures and all the adverse effects that come with it. Before either of these radical approaches can be taken, research has to be conducted. ScienceDaily recently posted an article about a study done to assess the geoengineering approach of artificially shading the planet. Scientists used climate models to simulate the approach and found that it significantly decreased both precipitation amounts and frequency. In North America, monsoonal rains dropped by around 7 percent. In South America and East Asia, they dropped by 6 percent. Geoengineering could be a godsend. It could buy us some more time to figure out how to stop emitting so many greenhouse gasses before we completely ruin the planet as we know it. It could also bring some unintended side effects. We’d guess that a lot more research will need to be done before the masses start feeling comfortable with the idea of such large-scale alterations. But, you’re the masses. Tell us how do you feel about geoengineering? Posted on November 6th under Global Ecology.